A few months ago I had a request for a roast recipe. I had to be honest with the person and tell them I was a bit of a failure when it came to making a normal roast in the oven, I know prime rib is a roast and I do enjoy cooking these; in fact I having been making one a year for 20+ years. They turn out excellent and my family looks forward to this special dinner every December. I don't know if the bone in the roast helps this particular type of roast turn out each time or not. I always associate the success of the prime rib because of the cut of meat that I am purchasing. The price is quite high and I assume that it will be perfect every time ( that might be wishful thinking..LOL). My family likes their roast rare or medium rare and so I don't worry about over cooking it. I think in my early days I overcooked the roast. I grew up with meat having to be "dead"or "brown" which meant no pink. I also have cooked all kinds of roast in my slow cooker. I use this meat for french dips. It is so simple with large crowds to add the meat in the morning, go and spend the day with family and come home to a roast that is tender and ready to be added to sandwiches. I soon realized this was not my cup of tea and stuck with my once a year Prime Rib and occasional French Dip roast prepared in a slow cooker. This recent request came as a challenge to me and so I wanted to try once again to see if I could make a regular roast in the oven. I love, that with age, comes experience. My roast turned out really good this time. I did not over cook it so it was not tough. I seasoned it with salt and pepper. I let it rest for 20 minutes under a foil tent. I was patient with my roast and allowed it to be prepared the right way and not just slam it into a hot oven, take it out and serve it. I believe these were the mistakes of my youth. The kids were thrilled to see the roast on the table. I found that the next day when I warmed up the meat it was even more tender and delicious. I love my roast with a dab of horseradish and sourcream with every bite. Please share your recipes of success for Roast Beef. What do you do different? How do you season your roast? I would love to hear your thoughts in the comments below. Unwrap the meat and coat with a thin layer of oil, I use olive oil. Add your seasonings to the roast. In a skillet or cast iron pan that is hot, sear roast on all sides. To bake the roast in, I use a shallow baking dish with a rim (the roast does drip during cooking). Lay roast in pan. Put roast in oven and cook for 20 minutes at the 425 temperature. Reduce heat to 325 and cook until the desired temperature has been met. I strongly recommend using a meat thermometer so the roast is not over cooked or taken out too early. It will cook, depending on size of roast for 2-4 hours at the lower temperature. Remember that the meat will continue to cook for a bit after it is removed from the oven. Cover with foil and finish side dishes. To reheat the next day, cut slices and microwave until warm. If you over cook it in the microwave it will get tough. You can also warm the meat up in a sauce pan for a few minutes on each side. Your roast is gorgeous. I haven't even attempted a prime rib yet but it's on my to do list. Our family favorite is Eye of Round. I use a steak seasoning as a dry rub placed on the roast the night before. I let the roast come to room temp sitting in the shallow pan (usually 9x13) while the oven heats. Oven starting temp is 475*F. I cook the roast at 475 for 20 minutes then shut the oven off and DO NOT OPEN it. Let roast cook for 2 hours. Let roast set for 5 minutes after removing from oven then slice thin with electric knife. 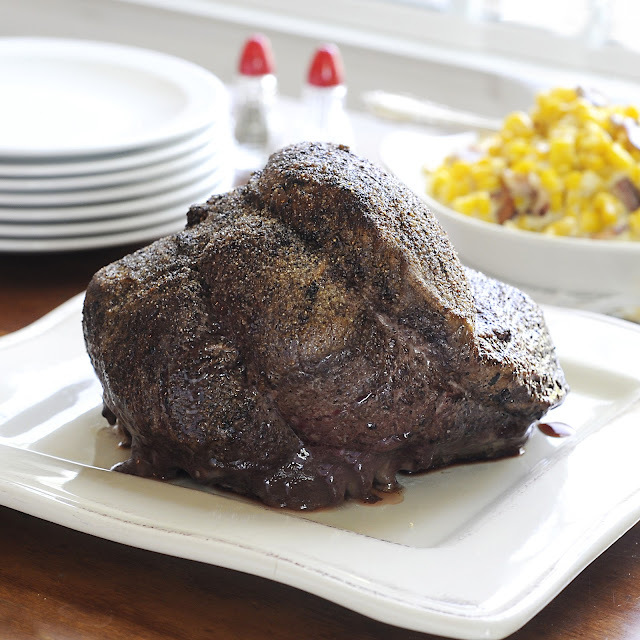 This produces a prime rib like roast for a fraction of the cost. 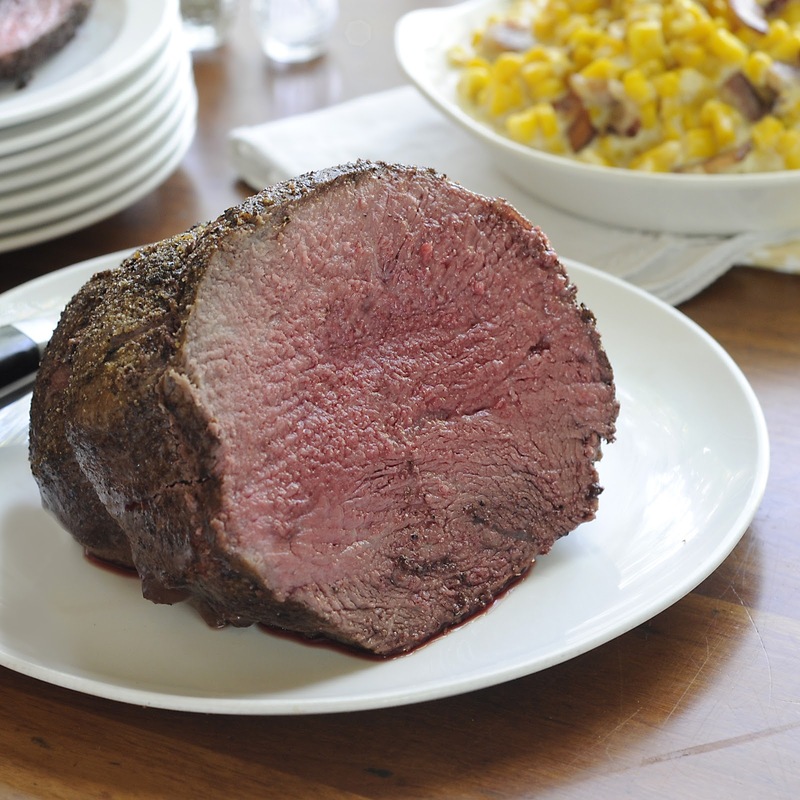 The eye of round roast I usually purchase is in the 3lb range from Sam's Club. A smaller roast would take less time.